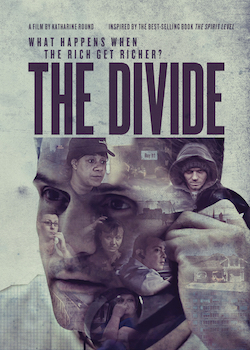 Weaving these stories and others with stunning footage and commentary from experts like Noam Chomsky, The Divide shows how virtually every aspect of our lives is controlled by one factor: the size of the gap between rich and poor. The film is inspired by the critically acclaimed, best-selling book The Spirit Level by Richard Wilkinson and Kate Pickett. "Fierce and unsettling . . . A short, sharp, shock of a film." "Searching and unexpectedly optimistic. The intimate people-centric approach makes for a more emotional experience than your average state-of-the-economy doc." "An excellent and timely documentary that shows how the behavior of the rich is out of control. Jaw-dropping stuff." "A sensitive exploration of a vital issue." "Extraordinarily timely, emotionally shattering, and formidable. This documentary will be analyzed to bits and viewed as a valuable testimonial in decades to come." "Serves as a reminder of a sad and salient truth about our contemporary world: the rich really do get richer and the poor get poorer."